A new analysis by non-profit Centre for Science and Environment has found high potential for replacing hydrofluorocarbons with greener alternatives in industrial setups. Hydrofluorocarbons are gases with high global warming potential (GWP). On the other hand, proposed natural alternatives to HFCs are low GWP, non-patented and energy efficient. A transition to these alternatives would minimise costs and maximise energy and emissions savings, the report finds. Some of the commonly used alternatives to HFCs in different sectors are propane (R290), isobutane (R600a), ammonia (R717) and carbon dioxide (R744). These refrigerants offer lower cost, have low GWP and high energy efficiency compared to their fluorinated counterparts. The analysis was published in a report “Prioritising natural refrigerants in India” conducted by CSE with the support of cBalance Solutions Pvt Ltd. The study was conducted to ascertain the current state of refrigerant use in the Refrigeration and Air Conditioning (RAC) sector in India and the role natural refrigerants can play. The current stock of RAC equipment in India is estimated to be 125 million tonnes refrigeration (TR is a unit of power). Stationary air conditioning (45 per cent), mobile air-conditioning (16.5 per cent) and domestic refrigeration (15.5 per cent) altogether account for almost 80 per cent of India’s installed cooling capacity. The report estimates yearly RAC equipment sale in India to be around 18.2 million TR. 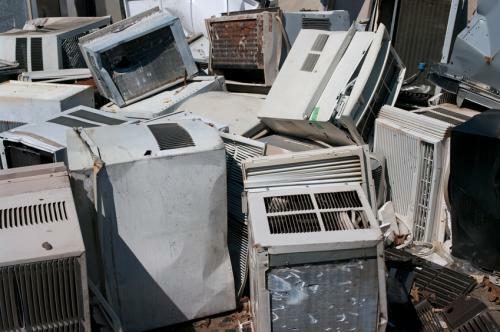 Sales in 2015 exhibit a similar pattern to the existing stock, with stationary air conditioning (44 per cent), mobile air-conditioning (20 per cent) and domestic refrigeration (13 per cent) accounting for almost 80 per cent of India’s added annual cooling capacity in 2015. Hydrochlorofluorocarbons (HCFCs) and HFCs account for 90 per cent of the total sales in RAC sector in India, remaining 10 per cent is held by natural refrigerants. In 2015, 44.26 per cent of RAC sales were from HCFCs and 47.29 per cent from HFCs. The use of HCFCs has gone down in most sectors. Today, HCFCs is used mostly in residential air conditioning (60 per cent) and commercial refrigeration (25 per cent). The reduction in HCFC use has been accompanied by an increase in the use of HFCs. The highest HFC use is in the mobile air conditioning sector (40 per cent), followed by domestic (19 per cent) and commercial (18 per cent) refrigeration. India’s total installed cooling capacity is slated to rise five times to 610 million TR by 2030. The most significant increase in annual sales is projected for the domestic air-conditioning sector—six-fold increase over the next 15 years. Other than the mobile air conditioning and transport refrigeration sectors, all sectors can move to natural refrigerants with current technologies. About 77 per cent of the RAC sector can switch to natural alternatives. Prioritising natural refrigerants will reduce the emissions from HCFCs and HFCs by 50 per cent. This will mark a dent of 50 million tonnes in India’s total CO2 emissions per year by 2030. India and other Article 5 countries have an opportunity to phase-down a large portion on their HFC demand with the use of low-GWP, non patented, natural refrigerants. Reaching this potential however will require enabling regulations, updated safety standards and market incentives for first movers. Bureau of Indian standards (BIS) has set-up a sub-committee to consider amendments to ISO 5149—the most prominent international standard for the use of flammable standards—to make it less restrictive for the use of hydrocarbon refrigerants, especially in domestic air-conditioning. Use of natural refrigerants offers energy efficiency in almost all applications under the RAC sector. The use of natural refrigerants will allow us to set more ambitious energy efficiency targets for ensuring energy security and reducing greenhouse gas emissions. A study by CSE estimates that a doubling of energy efficiency in the domestic air-conditioning sector alone will lead to reduction of 100 million tons of CO2 equivalent annually in India by 2030. In the ongoing negotiations, countries have agreed to have flexibility in implementation of the agreed phase down schedule. Parties can use this flexibility to prioritise natural refrigerants through funding from the multilateral fund. Article 5 countries can avoid an expensive transition with the use of patented fluorinated refrigerants.